I opened up The Dog Encyclopedia for Kids by Tammy Gangne for my boys after lunch today and they were immediately captivated by the beautiful pictures and little tidbits of information. Their curiosity exploded not just about these dogs but also where the breeds come from. We talked about Geography a little bit, we talked about allergies and how some breeds of dogs are hypoallergenic. We talked about dogs that help people and the important jobs that they do. They practiced reading hard words and learned the proper way to pronounce place names that they don't hear every day. I was very pleasantly surprised by how much my kids enjoyed reading this book. I had to drag my kids away to move onto the next thing we needed to do today. 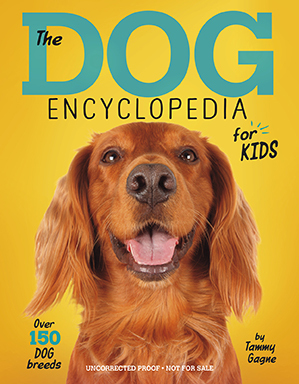 I highly recommend this Dog Encyclopedia for kids for just about any kid. I received a digital copy of this book from NetGalley.com for the purpose of this review. Links to Amazon are affiliate links. Thank you for supporting my blog! If you want to see what I'm reading to my kids right now then be sure to follow me on Instagram!